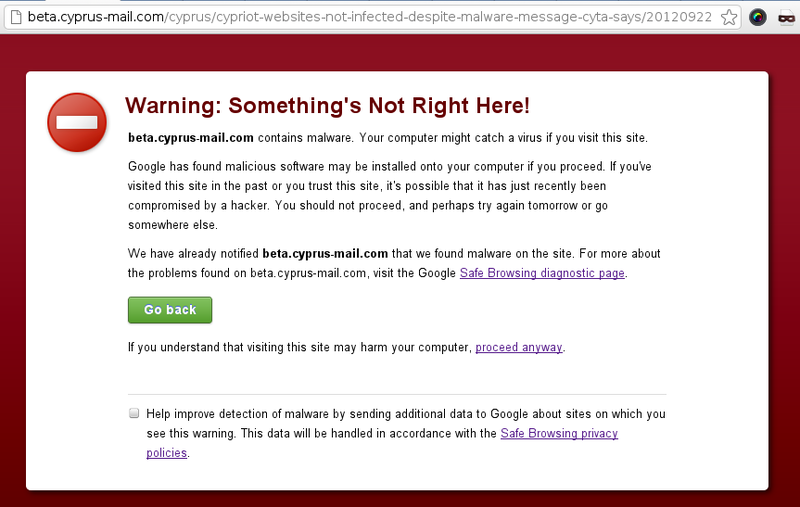 For the last few days, if you go to almost any Cyprus website, you get a warning like the one on the screenshot below. This message appears if Google Chrome detects that the site you’re trying to visit may have malware. Malware, short for malicious software, is software used or created to disrupt computer operation, gather sensitive information, or gain access to private computer systems. It can appear in the form of code, scripts, active content, and other software. ‘Malware’ is a general term used to refer to a variety of forms of hostile, intrusive, or annoying software. Malware includes computer viruses, worms, trojan horses, spyware, adware, and other malicious programs. CyTA said any computers receiving the message should clear their caches and cookies as the phenomenon was being caused by a virus, which was affecting connections. It said the sites were clean and did not contain malware. “It is a false message caused by a virus,” a CyTA technician said.